Through a range of level 4, 5 and 7 CPD short courses, education support professionals can hone their skills and knowledge in order to be better prepared to face the challenges of supporting students with dyslexia and SpLD in today’s education system. The CPD Short Courses include dyslexia and co-occurring difficulties, memory weaknesses, structured, cumulative multisensory tuition, study skills and assistive technologies to name a few. Many of our level 4 and 5 units focus on how to nurture the development of school learners with dyslexia with regard to key skills, such as reading, writing, spelling and numeracy. Other modules focus on supporting adults with dyslexia and working with learners in an international setting. We also offer a range of level 7 units for qualified specialist SpLD professionals to refresh and update their specialist literacy programme knowledge through online masterclasses. Full details can be found through the drop down menus below. Click on the relevant booking links to book either Units or Awards. How are the CPD Short Courses delivered? What short Level 4 and 5 CPD courses are available? An introduction to key elements of current research and practice in dyslexia and conditions that commonly co-occur with it. It aims to provide an understanding of current theories of dyslexia and the impact that dyslexia and co-occurring difficulties have on performance in a range of settings. This unit contributes to the Award in Developing Literacy Skills in Learners with Dyslexia (DAAWD52) and the Certificate in Supporting Literacy in Learners with Dyslexia (DACRT51). Examine the processes involved in mathematical thinking and how they link to aspects of memory and attention. The difficulties that learners with dyslexia and co-occurring difficulties, particularly dyscalculia, can have with numeracy are explained. The association of ‘number sense’ (numerosity) with dyscalculia is also examined. The unit explores theory, offers some practical ideas and provides the practitioner with the fresh perspective necessary to effectively use structured, cumulative, multi-sensory teaching to promote numeracy development in learners where it is stalled or significantly delayed. What short Level 7 CPD courses are available? This course will be of interest to practitioners wishing to develop tailored, multi-sensory literacy interventions for learners. Study of specific placement processes will enable practitioners to develop their own systems to appraise learners’ individual learning requirements. Units – Enhance your skills in a particular area with just one level 4 or 5 unit. Awards – Combine three units to achieve an award. Certificates – Combine two awards (six units) to achieve a certificate. Please note that it is not possible to sign up directly for a certificate course, you should sign up for units or awards in your chosen pathway first. Diploma – A combination of two certificates, one of which must be the Certificate in Strategic Teaching Support for Dyslexia and Literacy, make up the Level 5 Diploma in Strategic Teaching Support for Dyslexia and Literacy. How much do CPD Short Courses cost? If you want to apply for any of the above courses, please go to our Make a booking page. 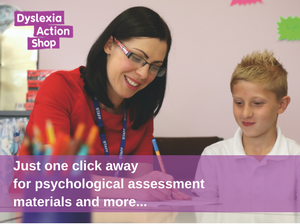 The CPD programme is designed and delivered by Dyslexia Action Training and quality assured by The CPD Standards Office and the British Accreditation Council. You will receive a Dyslexia Action Certificate upon completion.